Digitization is the order of the day! From ordering of books, mobile devices, food and jewellery – all of it is virtually accomplished. And as the online retailers and service providers were showering its audience with online deals and discounts, another advantage cropped up. That is online recharges that made life easy and seamless. Online recharges allowed customers to recharge their DTH, prepaid and post connections as well as pay their utility bills and also earn a great discount. This is where the Paytm mobile recharging offers and other coupon deals made a huge difference, thereby allowing customers to save big. The modern day living though offers benefits manifold, but it also brings about expenses. This is the reason why customers and avid online shoppers look for some kind of discounts and price reductions from various quarters. This is where online mobile recharges have come up as a pleasant surprise. Making use of multiple coupon and promo codes that the mobile network service providers are constantly introducing and alternating keeping in mind the festive season as well as other occasions, customers are encourages to pay their bills online or recharge their pre-paid accounts online and bag an attractive discounts. Till couple of years back many online shoppers restricted their online shopping to books, clothes and other commodities. They refrained from purchasing online being sceptical. However, today purchasing mobiles online has become an everyday affair considering the deals, discounts and the safety with which the online offers are provided and conducted. Similarly, recharging online using coupons and promo codes too were rare sometime back. In the recent times, the service providers like Paytm, Airtel, Aircel and many others have devised attractive deals to get more and more customers access these offers. For instance, today the service providers are all set to woo in the new customers by coming up with attractive first time users deals. These deals vary from a flat off of Rs.500, to promotional discounts of 50% on new connections as well as 100% cash back offers when customers opt in to pay by using credit or debit cards of chosen banks and the like. The benefits of the first time user deals are immense. It allows the users to save a huge amount which encourages them get into the habit on using online mobile recharging as a lifestyle. All said and done online mobile recharging is the simplest, easy and seamless way to have your prepaid accounts recharge. In fact the speed is instant! That’s the major benefit other than saving a good deal. 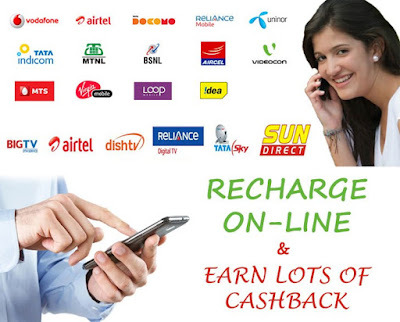 In the recent times the online prepaid recharge coupons are available both in retail stores as well as online stores and online coupon websites but it is available for a chosen span of time. This is one reason why customers need to make the most of the deal within the validity time else their chance to save will be lost! Author's Bio: A carefree traveler and gypsy at heart! Destinations, their people, habitats, crafts and iconic sites attract me. A passionate foodie having a fetish for European, Balinese and Turkish cuisine. A curio and artefact aficionado that loves to collect dream-catchers in particular. Love to myriad travel, food and life experiences !